Interested in hunting both small and big game with as few guns as possible? Are you the type of person who sees guns as nothing more than tools for hunting? What if, instead of spending all your money buying new hunting guns, you could just spend that money on additional hunting time instead? If that's the case, this is the list for you. I'm not the kind of guy who will ever try to talk you out of buying a new gun. However, if you own just the four hunting guns on this list, you can hunt any animal in the world. That's right: with a collection of just four hunting guns, you can cleanly and ethically take any animal ranging in size from squirrels all the way up to elephants. Before we start, I recognize that one piece of criticism leveled against these choices is that they may be a "jack of all trades, but a master of none." Of course there are other firearms that may be better at doing a particular task than some of the hunting guns on this list. However, the point of this list is to avoid specialization and present a minimum number of hunting guns to accomplish a maximum number of hunting tasks. A good hunting shotgun is an important part of any hunter's firearm collection. 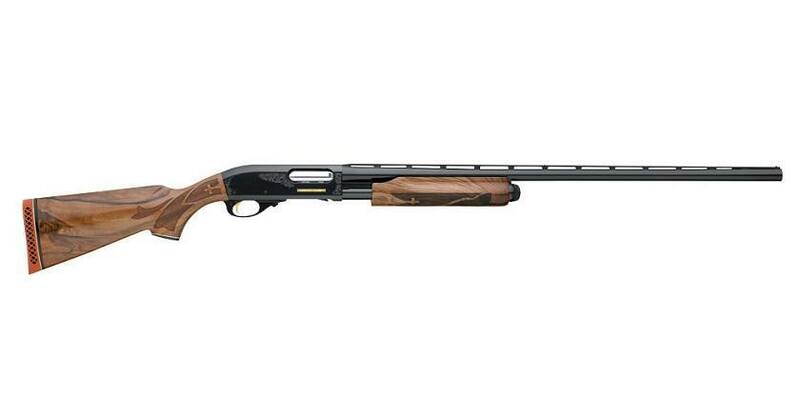 In addition to being a great home-defense shotgun, a 12-gauge Remington Model 870 (or a Mossberg 500 if that's more your cup of tea) with a 3-inch chamber is just about a perfect shotgun for hunting. Not only is the Remington Model 870 very reasonably priced and extremely reliable, but it's super versatile as well. If you purchase a 3-inch model with interchangeable choke tubes, you can use both 2 3/4-inch and 3-inch shells to hunt basically any type of bird: doves, quail, chukars, grouse, pheasants, turkeys, ducks, geese, etc. The Remington 870 is also a perfect choice for hunting small game, such as rabbits and squirrels. When loaded with buckshot, it's a deadly hunting shotgun for pursuing big game, such as deer and feral hogs at close range. Finally, you can also easily change out the barrel and install a rifled barrel with better sights. This quick modification turns it into an excellent slug gun capable of hunting big game at slightly longer ranges. Although there's a little bit of overlap in capabilities between the Ruger 10/22 and a good hunting shotgun, the 10/22 is still a solid addition to any collection of hunting guns. Small, lightweight and very reliable, the semi-automatic 10/22 is great for small game and varmint hunting. It's also just a good idea in general to keep some kind of .22-caliber gun in your collection. Though it's not quite as easy or as cheap to come by as it used to be, .22 LR ammo is still the least expensive ammo around, so you can buy a bunch of it without breaking the bank. It's also easy to store without taking up much space. Over the years, many rabbits, squirrels, and foxes have fallen to the 10/22. A skilled marksman can take down game at slightly longer ranges with a .22 than is possible when using a shotgun. There are also subsonic rounds available for the .22, which is ideal for people who don't want to make too much noise when hunting or shooting. Finally, several of the major manufacturers also produce "rat shot" rounds for the .22. These rounds are basically .22-caliber shotgun shells, designed for shooting rats, snakes and other undesirable creatures at close range in situations where you would not want to use a shotgun or a full-sized, .22-caliber bullet. With a good .30-06 hunting rifle, one can hunt the vast majority of big game in the world. The Remington Model 700 is a perfect choice for a hunter who wants a practical, yet reasonably priced hunting rifle. There is a reason why the Remington Model 700 is the most popular hunting rifle in the United States: it's accurate, reliable and easy to use. Some hunters are understandably hesitant about purchasing a Remington Model 700 after the recall of some Remington 700 rifles and the announcement that the company is filing for bankruptcy. If you don't feel comfortable using a Remington 700, that's fine. Fortunately, there are lots of other good choices out there for someone who wants a nice .30-06 hunting rifle. In fact, there are so many solid choices, it's actually really tough to label any one of them as "the best .30-06 rifle." For instance, the Savage 110, the Browning X-Bolt, the Winchester Model 70, and the Ruger Hawkeye (just to name a few) are all very popular hunting rifles with good reputations. Using a good .30-06 hunting rifle, it's possible to ethically take a wide variety of game, including mule and whitetail deer, black bear, feral hogs, elk, mountain goat, moose, sheep, pronghorn, red deer, zebra, kudu, zebra, eland and dozens of other species. In the hands of a skilled marksman, a quality .30-06 hunting rifle is also capable of excellent accuracy at long range. A skilled marksman should have no problems making a 300-400-yard shot (perhaps even more) on an animal with this rifle. Another advantage of the .30-06 is that there are a wide variety of bullet types and weights available on the market. While most .30-06 bullets are in the 150-180-grain weight range, it is possible to find them as light at 110-grain and as heavy as 220-grain, making it an incredibly versatile big-game hunting rifle. The .375 H&H Magnum is a must-have for anyone thinking about hunting large or dangerous game. This cartridge is significantly more powerful than the .30-06, but still has a manageable amount of recoil. A hunter armed with a .375 H&H is capable of taking down even the biggest, toughest animals in the world like cape buffalo, elephants, and brown bears. However, a .375 H&H bolt-action rifle is useful on many others, including those with thick skin. While the .30-06 Springfield will work in a pinch for hunting a moose, an elk, a caribou or a red stag, the .375 H&H offers a little more room for error. But, by no means is it "too much gun" for those animals. In fact, a .375 H&H rifle shooting non-expanding bullets is a very popular choice for hunting the Tiny 10 species of pygmy antelope because it'll ethically take these small and delicate animals, but cause surprisingly little damage to their hides. The same is true for many species of plains game, like impalas or zebras, when using a controlled expansion bullet. If you only could take one hunting rifle to Africa to pursue the widest possible range of game, a bolt-action .375 H&H would be my recommendation. What do you think about our choices for the four hunting guns you should own in order to hunt the widest possible range of game?